Hon. 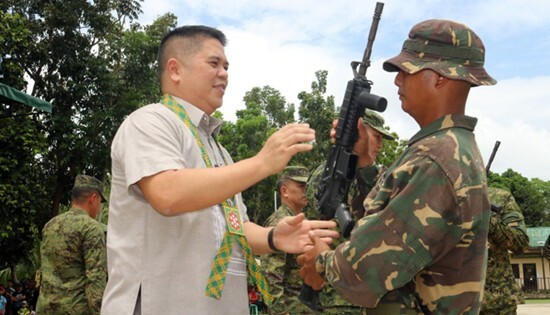 Edwin Marino C. Ongchuan during the Ceremonial Entrustment of Firearms to the Philippine Army Candidate Soldier Course Class 511-2017 at the 8ID Grandstand, Camp Lukban, Catbalogan City on March 24, 2018. CAMP LUKBAN, Catbalogan City – The Philippine Army Candidate Soldier Course Class 511-2017 was formally closed on March 24, 2018 at 10 o’clock in the morning at the 8ID Grandstand, Camp Lukban, Brgy. Maulong, Catbalogan City, Samar. The closing ceremony was graced by Hon. Edwin Marino C. Ongchuan, Representative, 2nd Congressional District of Northern Samar as the Guest of Honor and Speaker who further led the ceremonial entrustment of firearms, distribution of certificates and individual achievements. The entrustment of firearms to the 235 newly enlisted privates symbolizes their responsibilities and commitment to the people and the country. Hon. Ongchuan emphasized during his inspirational message their duty as public servants of the country. “As new soldiers, you should always remember the law for the benefit of the country. You have undergone rigid training, and some bad make did not survive, but you are in today feeling victorious because after all the hardship you gained confidence. So my dear graduates, let us be full upright in performing our duties with dignity and honor, let us avoid getting involved in any wrongdoing that will tarnish you being a soldier and servant of the Republic of the Philippines,” Hon. Ongchuan said. Meanwhile, Maj. Gen. Raul M. Farnacio AFP, Commander, 8ID reminded the new soldiers of 8ID the value of sacrifice. “Natutunan niyo noong kayo ay nag-aaply at nagsasanay pa lamang na sakripisyo ang kailangan para maging sundalo. Sakripisyo na mawalay sa inyong pamilya para sa mas maginhawang kinabukasan. At sa mga susunod na araw bilang mga bagong sundalo ng Republika ng Pilipinas, mas mararamdaman niyo na para magtagal at magtagumpay sa propesyon na ito ay kailangan pa ng mas malalim na sakripisyo. Ito ang sakripisyo para sa ating bayan,” he said. The youngest members of the Stormtroopers Division will join the fight against insurgency, illegal drugs, private armed group, and terrorism.